The Academy of Grounding is a blank canvas to focus the mind and soul. Here you’ll find an inspired space to train, to learn and to grow. Light, open and inviting, the space is designed to allow for students of all ages and abilities to focus on developing themselves through Brazilian Jiu Jitsu, Yoga and wellbeing classes and workshops. Traditional Japanese judo mats line the floors, while the calming white interior simplifies the intent of the dojo (or 'place of the way'). This is not a box. It’s not a cage fight. This is a place to find balance. If you happen to find friends, inner peace, or something you never knew existed inside you, then those are all good things too. Brazilian Jiu Jitsu (BJJ) is not just sport or a martial art. It is also a powerful self-defence system, a character builder and a way of life. BJJ advocates a balance of strategy and controlled aggression. It teaches us to be calm, respectful and disciplined; knowing when to act and when to wait. As a martial art, BJJ encompasses physical and mental discipline. As a sport, it feeds our competitive nature. And as a lifestyle guide, it helps us achieve equilibrium – through exercise, social connection and a focus on humility. Growing up surfing the beach breaks of Quebra Mar in Rio De Janeiro, Antonio Lauro learned to roll with the inevitable punches that come with fierce localism. Self defence wasn’t a past time. It was a necessity. 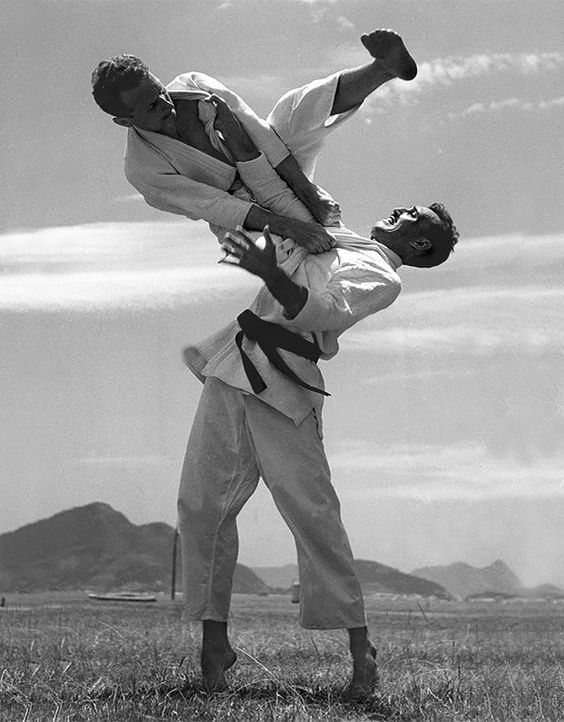 Through his connections with the Gracie family, he quickly learned their pure form of Brazilian Jiu Jitsu. Soon BJJ became as big a part of Antonio Lauro’s life as surfing, and he began to learn from Carlson Gracie’s protege Cassio Cardoso. He then trained under legends Rolker and Royler Gracie, sons of the Grand Master and founder of Brazilian Jiu Jitsu Helio Gracie. Antonio Lauro is one of a very small group of people who have received their black belt directly from the Gracies. His love for teaching others the ways of authentic Brazilian Jiu Jitsu has grown from the purest form of the gentle art. With a lifetime of experience and a calm, disarming humility that conceals his impressive technical ability, Antonio Lauro connects with students of all ages and abilities in a very direct and human way. It is a unique style of instruction that both challenges and respects students, and encourages growth in all aspects of their lives. At The Academy of Grounding we teach traditional Hatha Yoga, an art and science dedicated to the harmony of body, mind and life, which has been passed down by the great yoga master Sri Krishnamacharya. We believe Yoga must be customised in a safe and appropriate way for every individual and that Yoga is for every one, Krishnamacharya would say “If you can breathe, you can do yoga”. The teachings we pass down help balance the mind, bring greater awareness and self knowledge while at the same time benefiting the body’s mobility, flexibility and overall longevity. Each student will learn how to enjoy a simple and seamless approach of breath, movement, stillness and life. In our classes you will find that the balance of inhale and exhale is the centre focus of all asana, but above that, every individual is the centre focus for the teachings. It is our wish to share tangible, practical tools to allow any and every student the opportunity to develop their own personal practice and develop an understanding of how to apply real yoga into their lives effortlessly. No matter, what stage of yoga you are at, if you would like to book a free private session to meet resident teacher Kory and have a chat about what your yoga please send you details through the below link. Choose from 18 Group classes a week, including two Saturdays a month, for all levels. Small classes, personal instruction. A supportive, friendly environment whether you are interested in BJJ for life balance, self defence, fitness or competition. Classes include techniques, physical drills and live training. All kids need a super-powered dose of self confidence to grow strong and healthy and take on the world. Classes develop self defence skills, respect, focus, discipline, social skills and self control in a fun, friendly environment. Ages 4 - 8 and 9 - 15 years. Monday, Wednesday and every second Saturday. Many of our students benefit from one-on-one tuition. This program can help propel them forward in their physical ability and understanding of their own body, goal achievements and general knowledge of the sport. Hourly time slots are allocated and can be the perfect accompaniment to a student’s weekly or monthly training schedule or in isolation to group classes. For the students who want to take their training to the limit and challenge themselves through competition, we have a special one-on-one, or small group discounted mentoring program. This program has been created to help develop strong skills and knowledge to get any fighter ready to accomplish their goals. A breath centric flowing practice that naturally and seamlessly moves from breath to movement to pranayama then meditation with traditional teachings of Yoga as taught by Krishnamacharya. These classes are set up for every level, from beginner to advanced to enjoy. Learn how to create your own individual yoga practice for life with personalised tools that suits your age, health, flexibility, energy, experience and culture. Enquire with Kory to have a customised program created for you. Suitable for every level, from beginner to advanced. These classes combine the techniques of stretching, flexibility and respiration of hatha-yoga, the ground movements of jiu-jitsu, and the natural movements of the human body. Idealized by our dear friend and teacher Alvaro Romano, these classes are a revolutionary method of physical conditioning that has an objective of developing physical qualities associated with motor and mental skills. For beginner to advanced students wanting to step deeper into their evolution of practice and their understanding of the teachings, the lineage and how to apply the complete system in a practice, we also hold The Lost Teachings workshops occasionally. Keep an eye on the events page. Or ask Kory for more info. We like to think of The Academy of Grounding as a sanctuary open to absolutely everyone; a calm place of contemplation and reflection especially beneficial in difficult times. This is why we offer all our yoga classes free of charge to anyone in need. It is our wish to pass on some simple tools like breathing, moving and stillness that can be used as a gateway to build self-compassion and kindness. If you or your friends or family would benefit, please contact us to arrange a one-on-one class or find out about group classes. We love meeting people from all walks of life, from the beltless to the black belts and yoganaughts to the well seasoned yogis. We would love to meet you and offer private class with Antonio Lauro and Kory at no cost, in this time you can share your goals, questions and also learn a little about us. Please send us your details and we will be in contact with you shortly. We look forward to meeting you soon. Monthly weekend Yoga Intensives check facebook for updates.